Terry tells Paul that she hasn't seen Charles since they were married. Scott is frosty towards Terry. Lucy takes a photo of Douglas and he jumps, saying he doesn't like having his photograph taken. Paul tells Terry that it's over between then. Terry tells Paul that she's pregnant. Paul is shocked. He sits down heavily. He says he doesn't believe her. Terry says she doesn't care what she believes and storms into the bedroom. Paul says he saw her with Shane. Terry says she was just apologising to him, but as usual Paul thought the worst. She doesn't want to split up - it would break her heart. Terry asks Paul to believe her, not Charles. She only told lies to get herself out of trouble and they weren't about anything important. Paul says he has to go out. Helen and Douglas come in on their way to the pictures for a cup of coffee. They sit at a table and chat about the cottage. The loan will be finalised tomorrow afternoon. 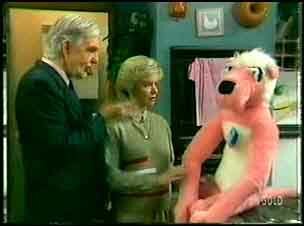 Paul comes in and sits down with Helen and Douglas. He looks down and Helen asks if they can help. He says he'll sort things out himself. Jim has come round for a cup of tea. 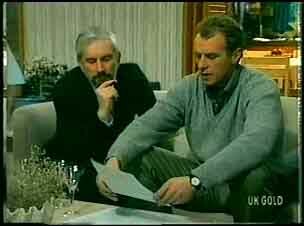 He tells Terry gently that he and Anne packed each other's things lots of times. Terry starts to cry and Jim hugs her. Jim tells Terry that Paul loves her very much, and he knows Terry loves him. He tells her to come round any time if she wants to talk. When Jim has gone, Paul comes in. He tells Terry he's decided to give them another go - at least until the baby comes along. He looks very depressed though. Scott is bathing Basil when Terry and Paul comes round looking a lot happier. Paul tells him to come inside - they've got something to tell the family. 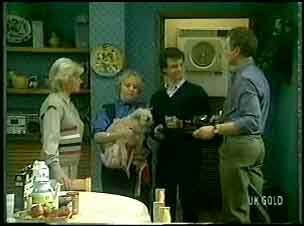 Inside, Paul tells the family that Terry is pregnant. They are all very pleased, except Scott who looks rather unsure. In the kitchen, Jim tells Paul that Terry loves him very much. In the living room, Terry tells Helen that at least she'll be busier now. HELEN: Oh! Looks as though I'm going to be a great-grandmother after all! SCOTT: Hey, that means Dad'll be a grandpa! JIM: Shut up, Uncle Scott! Daphne's grandad is on the phone arranging gig. He's very excited and tells Shane that he's done well as a result of the talent quest - he's been offered a job. Shane says that's good for him, but his own life is rotten. From now on he's staying out of other people's problems. 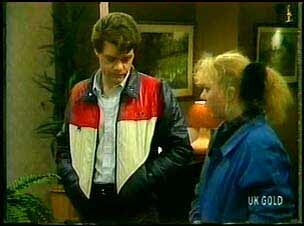 Paul asks Terry if she minds if he goes into town to pick a few things up. She agrees. They are a bit awkward, but then they hug and Paul tells her he's beginning to like the idea of becoming a father. Jim tells Scott to be a bit more enthusiastic about Paul and Terry's news. There's a knock at the door and it's Barbara. She asks Terry how she's been and she tells her about Charles causing trouble between him and Paul. Terry tells her she's sorted it though - women have the ultimate weapon against men. TERRY: Congratulate me, Barbara. I'm pregnant. Barbara is in a phone booth talking to Charles. She tells him that she's meeting Terry in about twenty minutes in the Coffee Shop. Scott walks by the phone box but doesn't see her. 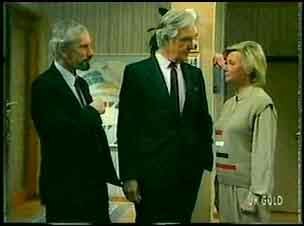 Barbara tells Charles that Terry is a lot cleverer than he thinks. Douglas asks Helen to advise him on a painting. She quite likes it. Helen tells Douglas that Terry is having a baby - she's going to be a great-grandmother! Helen hopes that she'll see the child when they're living in the country. Barbara has come in for a coffee. Terry comes in and joins her. She's shocked to see Scott there and sits down with Barbara. She tells Barbara that Scott is suspicious but she's worked too hard to let her marriage break up now. Terry tells Barbara that she should have taken insurance on Charles before breaking it off with him. She herself made a tape of him talking about his dealings with Robert. She tells Barbara that the tape has gone, but Charles doesn't know, so she's safe for now. Barbara is secretly pleased and tells Terry she has to leave for an appointment. Terry asks Scott how it feels to be an uncle. He says he's still thinking about it. Terry wants them to be friends again - there's nothing between her and Shane. Scott says he knows what he saw. Paul and Jim are having a chat. Terry comes out and tells them that the solicitor has arrives. 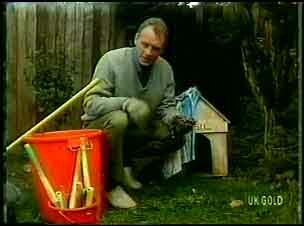 Jim is cleaning out Basil's kennel and finds a tape with all the innards pulled out of it. JIM: I hope this wasn't important, or you'll be in the doghouse! Paul is putting champagne on ice for them. Jim comes in and says he's found a cassette tape in the kennel. He tells them it's beyond repair though. Paul tells Terry he's taking her away for a second honeymoon to make things up. She hugs him. The solicitor is explaining that Douglas will sign the money over to the estate agent and Jim and his partner will get the cottage as collateral for the loan. In the living room, Jim is signing the papers. 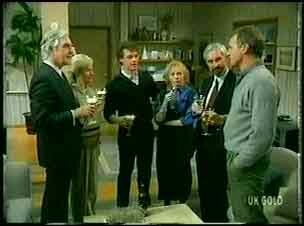 They all have a glass of champagne and Jim proposes a toast to four generations of the family. He hopes Paul and Terry will be as happy as Douglas and Helen will be in their new country home.